Racelogic Ltd., of Buckingham, United Kingdom, has introduced LabSat, a one-box system designed to record and replay real-world GPS data for use in designing and validating GPS products. Based on a in-house system developed for testing and calibrating Racelogic’s VBOX products, LabSat connects to a PC via USB 2.0 and records raw signals from a GPS antenna directly to hard disk, without limitations on the number of satellites being tracked or the length of the recording. VBOX is a GPS-based system for measuring the speed and position of a moving vehicle in performance and brake testing. According to the company, when the logged data is replayed, a GPS receiver will recreate the movement and satellite reception encountered during the test, including all original multipath, satellite obstructions, and atmospheric effects. 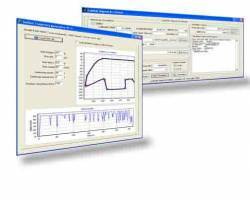 Options include LabSat Signal Architect software can simulate dynamic scenarios without the artifacts of real-world data and optional IMU modules that enable users to record data from inertial sensors and replay them synchronized with GPS data. LabSat comes bundled with a 250 GB USB drive and pre-loaded recordings. Prices begin at £5,950 (US$8,470).